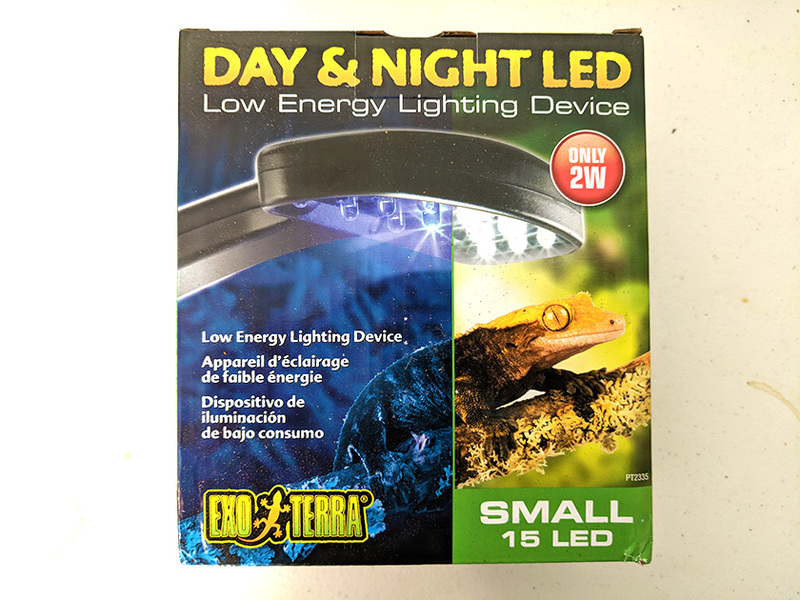 A few months back I decided to try the Exo Terra Day & Night LED; I thought it would work perfectly for a terrarium set up I was working on. Since I’ve been using it for a few months now, it’s a great time to do an in-depth review. If you’re considering purchasing this device, please read through my review first. I won’t try to persuade you either way. My goal is to help you make an informed decision. 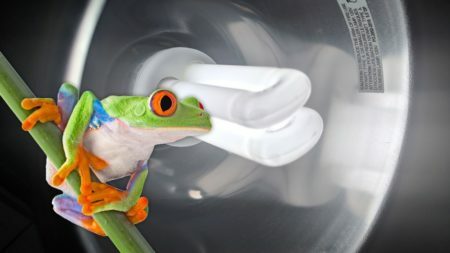 Also, I’ll do my best to explain why you should or should not get this light, depending on the type of habitat you’re creating for your frog. I’ve been used the Exo Terra Day & Night LED for at least two months now. I bought mine on Amazon for about $25 and, I have to say, I like it. So far, I have two complaints. One is my fault and the other is not. I accidentally bought the wrong size. They offer a small and large option. Apparently, I wasn’t paying attention during the checkout process and ended up buying the wrong one. Oops! Oh well, it’s doing a decent job. Anyway, I’ll go over my likes and dislikes here. Below, I’ll explain who should get this and who should not get this and after that, I’ll tell you what I really think. I like this light because it’s an LED and fixture in one, and it’s cheap. The small version is a 2W, 15 LED light with, as the name suggests, a day mode and a night mode. With low energy usage, it’s not going to run up your electricity bill. Plus, it has the added benefit of helping you watch nocturnal species at night. I guess the night LED is meant to replicate moonlight? This is what my terrarium looks like using the night LED. I have to say, it looks much brighter in this picture than it does in person. Aside from the low energy consumption, it’s easily mountable via the sticky surface on the bottom. It is possible to remove it from its original location but there is no easy way of doing this; just keep pulling until it comes loose. I’ve only done this 3 or 4 times so I’m not sure at which point the adhesive will wear out and stop sticking. Last but not least, the touch button is really nice. Simply tap the icon on the top of the device to switch from day mode to night mode. Tapping the icon again will turn it off. Tap again and you’re back in day mode. Here is a top view of the light on the side of my terrarium. Notice the little icon at the bottom. That is where you tap to switch modes from day to night, on and off. What I don’t like about the Exo Terra Day and Night LED is the way you mount it. I don’t have an issue with the adhesive. That part is fine. The problem comes when trying to stick it to an Exo Terra terrarium. There is not enough room between the lip of the terrarium and the light fixture to mount it flat against the glass. Maybe this is has something to do with the small and large versions, I’m not sure. After all, I accidentally got the small fixture instead of the large one. Either way, I just assumed an Exo Terra light fixture would mount perfectly to an Exo Terra terrarium. Now that you know a little bit about the light, I’ll tell you why you might need it. To clarify, I’m not trying to convince you to buy it. Rather, I’m going to explain why you might need it. In the next section, I’ll explain why you don’t. 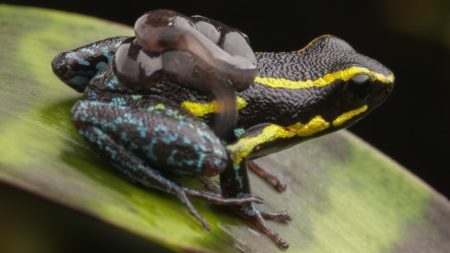 The day & night LED is perfect for enclosures housing nocturnal species of frogs. 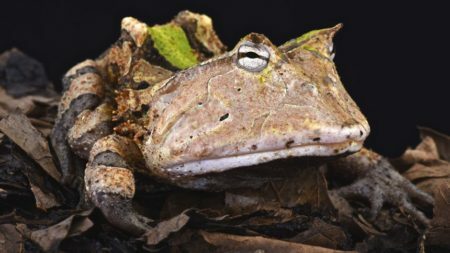 Really any type of frog that does not require UVB lighting. Another reason you should get this light is to provide a day and night cycle in a room that receives little or no natural sunlight. It’s the perfect, easy to use light fixtures for terrariums using fake plants. 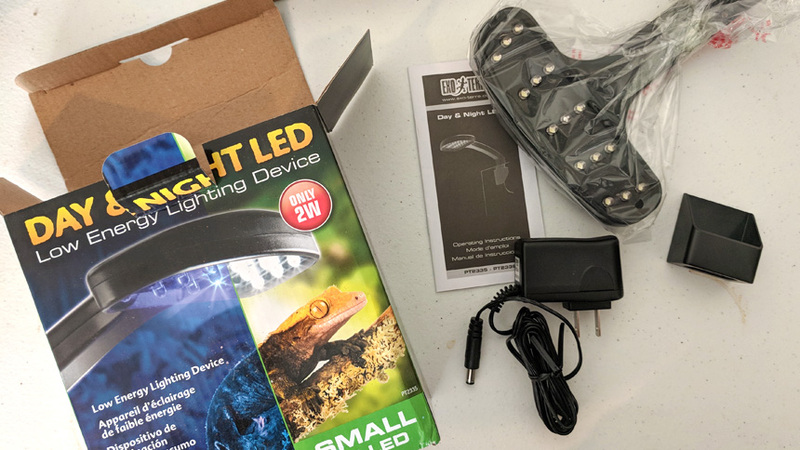 Last but not least, it provides a nighttime light for viewing nocturnal frogs while they’re most active. The Exo Terra Day & Night LED is such a low powered LED, it should not be used as a grow light. In all my research, I’ve yet to find any specs on the lighting. No lumens, kelvin, or spectrum range is mentioned. 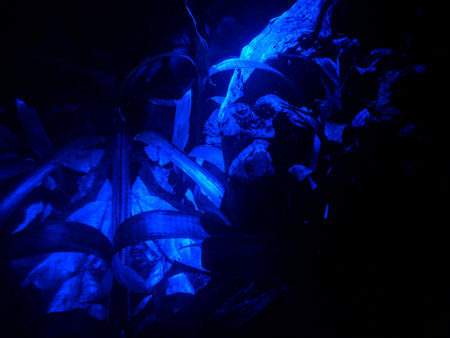 If you need special lights for living plants, this is not your best option in my opinion. It’s not a basking lamp. 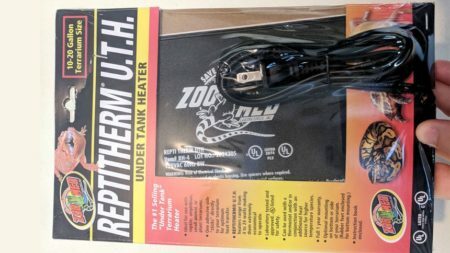 It will not raise the temperature of your enclosure as it’s not meant for that. Last but not least, there is no UVB output from this device. 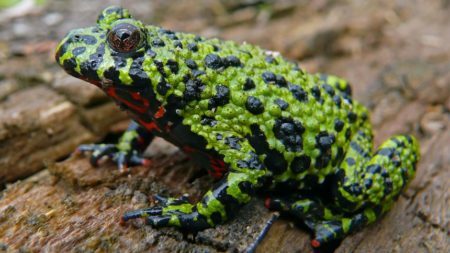 It should not be used for frogs that require UVB. This should go without saying but, you certainly don’t need this in conjunction with another lighting source. I honestly like it. I will recommend it to anyone who needs a simple light for providing a stable day and night cycle only. Like I mentioned above, it’s not meant for growing live plants nor does it output UVB. It’s just a nice LED light for your terrarium. It’s not automated, nothing incredibly fancy; aside from the touchpad, of course. If you’re interested in buying the Exo Terra Day & Night LED, click here to check the current price on Amazon. I’ve taken the liberty of searching the internet for the most common questions regarding the Exo Terra Day and Night LED. Since I’ve been using it for a while now, I will happily answer these questions below. 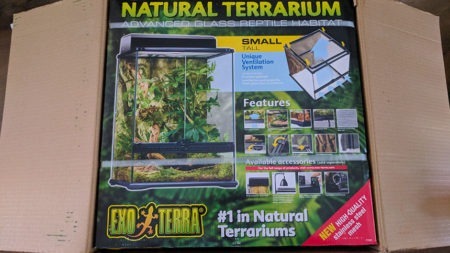 Will it increase the temperature of my terrarium? No. LEDs are extremely efficient. They’re cool to the touch, actually. Their heat output is so insignificant that it’s no cause for concern regarding the temperature of your terrarium. If you need to increase the heat, you should look into a basking lamp or heating mat instead. Does the light cycle between day and night automatically? No. You have to manually switch the light by tapping the top of the fixture. It will remain on the setting you leave it on until you change it. However, I’ve read about people having problems with their night LED shutting off after 30 or 45 minutes. As far as I know, this is a defect, not a built-in feature. After plugging in the device into a power outlet, it should turn on. If not, tap the top of the device where the sun and stars icon is. 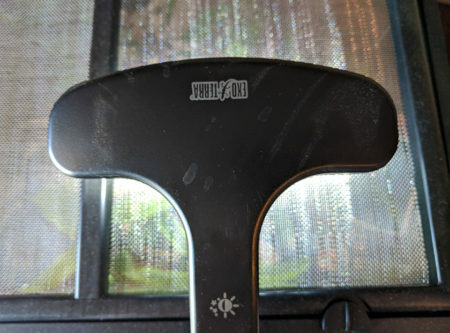 On mine, simply touching the edge of the fixture has no effect; you must touch on or near the icon. The first tap turns on the day mode, the second tap switches to night mode, and the third tap turns it off. Will this work as a grow light? Probably not. I say ‘probably not’ because I’m not entirely sure. I looked for information regarding the light quality but I could not find anything. It’s not a UVB light, that’s for certain. So my answer is no. If you need a grow light, look elsewhere. Most grow lights are labeled as such, and this is not. It might provide some benefits to living plants but I don’t recommend using it for a grow light. Do you have a question about this device? If so, use the comment section below and I’ll do my best to answer your questions in a timely manner. Thanks for reading!